While plenty of headphone manufacturers have turned their attention towards true wireless earbuds, plenty others are still making great wireless in-ear headphones that wrap around your head. Like, for example, Blitzwolf, with the Blitzwolf BW-BTS1 headphones. Not only do the headphones seem to have a relatively nice design, but they come at a great price too — only $26. But at that price, do the headphones sacrifice too much in the way of quality? We put the Blitzwolf BW-BTS1 headphones to the test to find out. The first thing to note about these headphones is their design, and they’re not bad-looking at all. The headphones come in black, though they have white accents like the Blitzwolf logo on each earbud. Apart from that, however, they’re sleek, stylish, and simple. We like that. Part way down the right side of the cable, you’ll find a small control remote with a basic three-button setup and a MicroUSB charging port to charge the headphones. Again — it’s basic, but we like it. The earbuds are magnetic too, meaning that when you’re not wearing them, they can attach around your neck, ensuring that they don’t fall off. One thing we don’t like is that there don’t seem to be any left and right indicators on the earbuds. While most people will be able to figure it out given the angling of the headphones, it’s still a bit of an oversight. In the box, you’ll get the headphones themselves, a MicroUSB charging case, a total of three pairs of ear tips, a total of three pairs of sports wings, and a few cable clips. You’ll also get a nice clamshell case to keep everything in, which is a nice addition, especially for a pair of headphones in this price range. The headphones have a slightly large earbud shape, but thankfully that doesn’t necessarily translate into a low level of comfort. In fact, the headphones are actually quite comfortable. Like any in-ear headphones, we recommend experimenting a little with the ear tips and sports wings to find the right size. The pre-installed accessories worked perfectly for us, but it’s doubtful that will be true for most people. One thing we did notice is that if you want to clip the cables behind your head, you have to be careful that you don’t clip them too tight — as if you do, they’ll be a little more likely to fall out and won’t fit quite as well. It wasn’t a huge issue — but something to note nonetheless. In the end, perhaps the most important thing to consider is sound quality — and these don’t sound bad at all. Let’s start with the bass, which is relatively strong, though perhaps not as deep as some might have liked. There’s certainly a slight boost in the bass here, but it’s not over the top — as some headphones tend to do. The mid range is well-tuned, but definitely tuned. There’s a slight bump in the low mids, which contributes to a slightly warmer tone, and a slight cut in the high mids, which results in things like vocals and guitars seeming to take a back seat. The high end is perhaps the weakest aspect of these headphones — though that’s to be expected of headphones in this price range. That’s not to say it sounds terrible either — things like cymbals certainly have a sizzle to them, and the high end is far better than we would expect from a pair of headphones in this price range. It did seem like the headphones distorted a little more easily than we would have liked, which was especially true in the high end. In general, for a pair of headphones in this price range, the Blitzwolf BW-BTS1 headphones sound great. The Blitzwolf BW-BTS1 headphones connect to your listening device through Bluetooth 4.1, and as such you’ll get a listening range of around 10 meters, or 33 feet. We found that the headphones seemed to retain a connection pretty well within that range. When it comes to battery life, the headphones sit in at around 6-8 hours. That’s not great, but it likely has something to do with the small control module. Often, manufacturers will include another module with only a battery, but Blitzwolf has decided against that, and the result is a low battery life. The Blitzwolf BW-BTS1 headphones aren’t perfect — but in this price range, they’re pretty close. They feature a relatively sleek design, are generally comfortable, and sound good for the price. Im fact, if you’re looking for a pair of wireless headphones and don’t want to spend more than $30, we don’t think you can do much better. Of course, there are some other options. 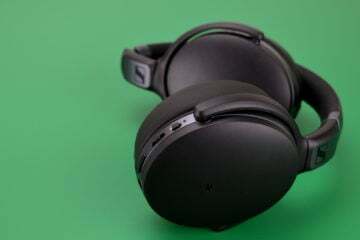 For example, you could go for the Creative Outlier One headphones, which have a better battery life and slightly better sound but aren’t quite as comfortable. Considering their excellent value for money, we’re awarding the Blitzwolf BW-BTS1 headphones the Headphone Review Silver Medal.